Join local experts Saturday, March 9th at the Casper Mountain Outdoor Center at McMurry Mountain Park! REGISTER NOW to reserve lesson times, ski equipment, busing, and prizes for first registered families. Equipment is on a first come, first serve basis. Paper packets are available at the National Historic Trails Interpretive Center in Casper. For registration questions, please contact Stacey at 261-7787. 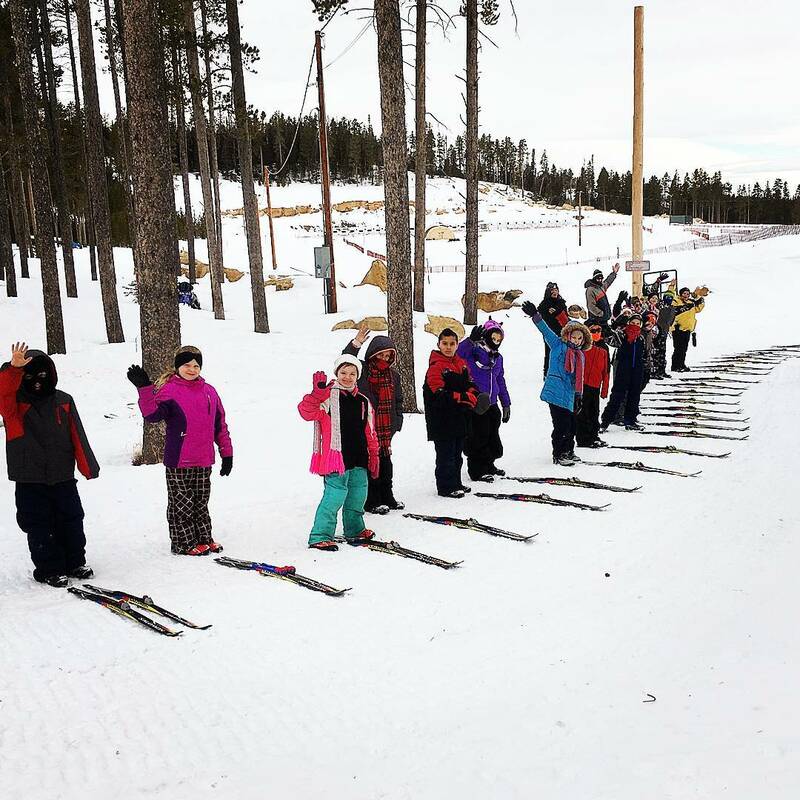 For more information about Winter Adventure Day, please contact Casper Mountain Biathlon Club at 215-4054. Busing from the Boys and Girls club available for registered families. Please register to reserve your travel times. 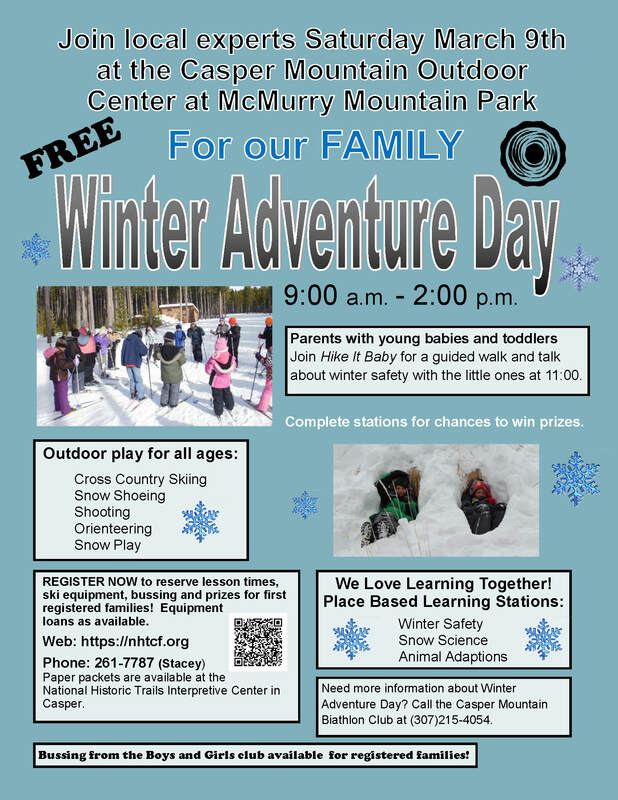 Enjoy the benefits of outdoor play and learning in the snow with your family during the Winter Adventure Day, Saturday, March 9th, at the Casper Mountain Outdoor Center at McMurry Mountain Park (Biathlon Center) on Casper Mountain. Activities are geared for all ages and generations of the family. Placed-based learning stations will inspire hands-on family learning about our local environment. Families can then play together in the snow with the options of cross-country skiing, snow shoeing, shooting, orienteering or just digging in the snow. If your family is far away, bring a group of friends. Participation is free, but equipment and lessons are limited to a first come basis. Register to reserve equipment times, lessons, and bussing (if needed). Prizes are available for the first registered families. Complete stations as a family for chances to win more prizes. Families with toddlers and infants can join Hike it Baby at 11:00 a.m. for a guided walk and talk about winter safety with children. Registered families will receive an email confirmation of registration and bussing times. Please allow a few days for confirmation. Winter Adventure Day will take place on Saturday, May 9, 2019 from 9:00 to 2:00. Two ski lessons will be offered in the morning and one in the afternoon. Place based education stations, shooting, snow shoeing, and snow play will be available throughout the day. The event is located on top of Casper Mountain at the Casper Mountain Outdoor Center at McMurry Mountain Park at 1110 East End road. To get there, drive Casper Mountain road to Bear Trap Meadows and turn left on Tower Loop road. Continue until the road turns into East End Road. The Center is located on the left hand side. The event will take place even if it is snowing. If weather exposure is detrimental to the presenters then the event may be cancelled. Please wear appropriate winter clothing. Layer clothes to allow for adjustments to the weather. It is recommended to have waterproof pants, coat, and gloves for all participants. Activities will include digging and playing in the snow. Some hot food will be available for purchase by local vendors. Families are also welcome to pack your own picnic lunch and snacks. We will picnic outside in the snow. Please be aware that the site does not have a cabin or running water. A storage hut is available to the ski club. Porta-potties will be on site for participants. Parking is limited so we encourage car-pooling. A shuttle to bear trap lot will be available if parking fills. Bussing from town will be available for participants needing reliable transportation up the mountain. Bussing is for requesting registered participants. Pick-up and return times will be determined as needed for registered participants. Numbers are limited. Busses will leave and return from the Boys and Girls Club on East K Street in Casper. For registration and event questions please contact Stacey at 261-7787 or Cathy at 215-4054.